Punjab University Latest New jobs in March 2019. The application is invited from Pakistani Nationals for the following posts against disabling quota for appointment in the University of the Punjab, Lahore. 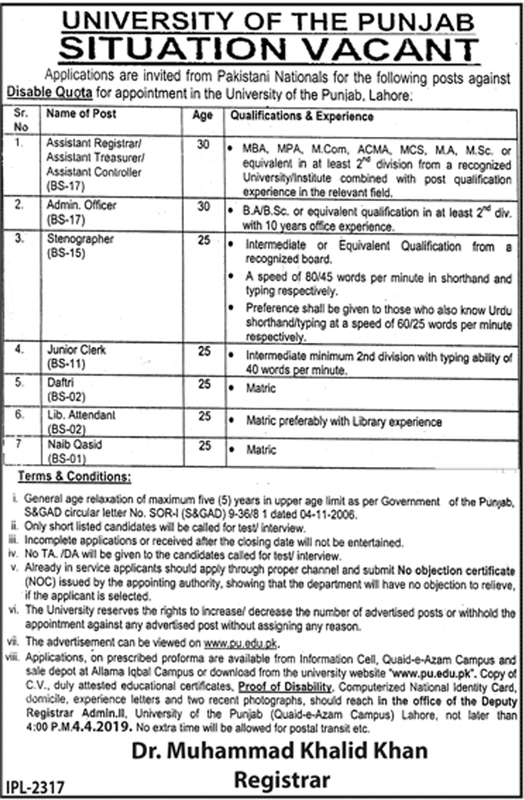 PU job 2019 for Assistant Registrar, Assistant Treasurer, Assistant Controller, Admin Officer, Stenographer, Junior Clerk, Daftri, Naib Qasid. Your education should be MPA, MBA, M.COM, ACM, MCS, MA, M.Sc with the 2nd division or BA, BSc, Intermediate with shorthand speed. How to Apply for PU jobs in 2019? The advertisement can be viewed on the PU website. only shortlisted candidates will be called for test and interview.